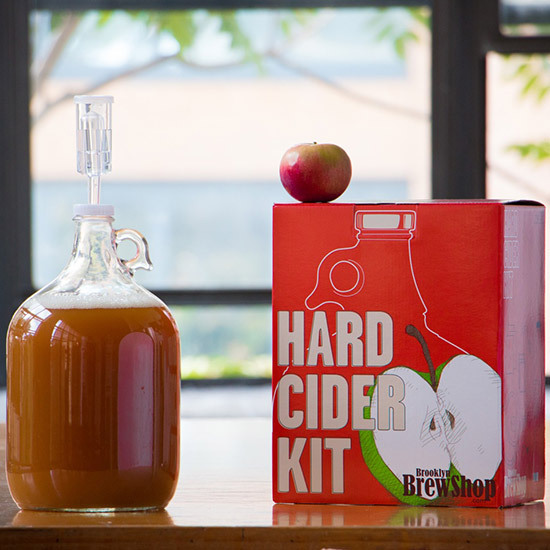 You can make hard cider at home in as little as four weeks. Here's how. If you want to impress your friends this fall with DIY booze, there’s a good reason to forget about beer. Brewing cider is amazingly simple, and the process can go from start to finish in just four weeks. 1. Source your juice. If possible, hit an orchard or fruit-producing farm for fresh juice. Or just look for all-natural bottled juices, with nothing added. You can also buy fresh apples and juice them. Whatever you do, taste before you act. Great cider begins with great juice. 2. Gear up. For your first batch, all you really need is yeast, a vessel and a system to vent off the carbon dioxide fermentation produces—but it’s best to buy a kit. Brooklyn Brew Shop sells an excellent one-gallon starter kit for $40, or to make bigger batches, Midwest Supplies sells a 6.5-gallon system for $60. 3. Sanitize! Worthwhile brewing instructions will stress the importance of cleaning your equipment with no-rinse brewing sanitizer. It will kill bacteria that could cause a host of issues during fermentation. 4. Brew. Your kit’s instructions will have you mix yeast and juice together in what’s known as a carboy container, and then let it sit for two weeks. 5. Flavor. Feel free to skip this step, but it would be the point to add flavoring agents like spices, bourbon-soaked oak-chips (for a barrel-aged effect) or hops (to add the bitter, floral notes of a good IPA). “Cider is a great platform to experiment with,” says chief brewer Al Marzi of Boston’s Harpoon Brewery. But that experimentation is entirely optional. Marzi makes a traditional dry cider at Harpoon, but he changes it up for limited-release versions like a Belgian dry-hopped cider and an apple-pumpkin cider during fall. 6. Bottle. Two weeks is all it takes for yeast to turn juice into hard cider—but this flat brew won’t be much fun to drink. To make your cider fizzy, you’ll need to induce secondary fermentation in a closed space: That is, you’ll need to bottle it with a bit of sugar (like honey, maple syrup or molasses). The still-active yeast cells will eat it up, producing a little more alcohol as well as carbon dioxide—which will be trapped under cap and forced to dissolve into the cider. Here’s the part where you should really pay attention to your kit’s instructions, because too much pressure can cause a bottle to explode. Read the directions. 7. Enjoy. Your cider will be ready to drink after two more weeks. If all went well, you’ll have a crisp, dry, delicious beverage to pour for your friends at December dinner parties. And if your first batch isn’t amazing? Turn it into sangria.